WMS (Web Map Services) provide a standard means of downloading maps from the internet and a MapActivity allows to layer maps obtained this way onto the Google baselayer. 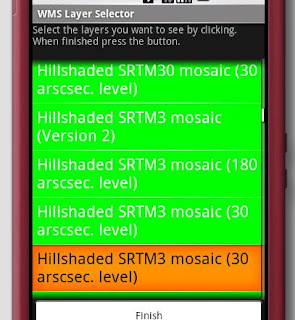 The mechanism of this was a bit explained in a previous post, but here I want to talk a bit about managing a number of user selectable WMS Layers. First of all WMS servers provide all the information about their maps in a capabilities document, an XML description of maps and their properties provided by that server. Every user-downloadable map comes as a Layer element in that document. So if we give users the ability to put in the base url of an WMS server, parsing the document for available layers is not so hard and can be done with an XmlPullParser. 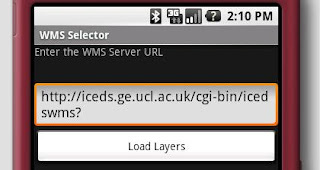 The base URL for such an WMS Layer is the URL in the picture, for the ICEDS server hosted at University College London. This is the complete URL for the capabilities document from that server: http://iceds.ge.ucl.ac.uk/cgi-bin/icedswms?service=wms&version=1.1.0&request=GetCapabilities. layers);                                 // Pass in the cursor to bind to. // Bind to our new adapter. (There is a little issue with that WMS Server: technically, all layers with a NAME should be displayable, but this servers has some layers with names that are just used for grouping and will just display an error message when requested).